Be the first to share your favorite memory, photo or story of Johnathan. This memorial page is dedicated for family, friends and future generations to celebrate the life of their loved one. 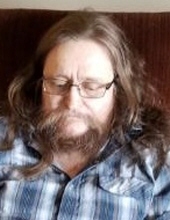 Johnathan Hoffman, age 58, of Madison, passed away on Wednesday, April 10, 2019 at the Avera McKennan Hospital in Sioux Falls. Memorial service will be 2 PM on Thursday, April 25th at Weiland Funeral Chapel with Rev. Elizabeth Pagnotta officiating. Visitation will be one hour before the service. Inurnment will be in Graceland Cemetery. Johnathan Everett Hoffman was born July 17, 1960 in Denison, IA to Melvin Hoffman of Rawlins, WY and Barbara (Hedberg) Hoffman of Brookings, SD. He received his GED and went to college in Jackson, MN. After college, he began working as a mechanic. He loved working on cars, trucks and spending time with family & friends. Johnathan’s children feel very blessed for their father who had the right balance of love, support and discipline to raise three children. His smile and comfort will be missed dearly by his loved one’s family & friends. He will be remembered for his jokes & a smile for everyone. Left to cherish his memory include his children, Bianca Walker of Mitchell, SD, Ariel Walker Jackson of Madison, SD and Adam Hoffman of Brookings, SD; he will be deeply missed by his four siblings, Melvin (Dorothy) Hoffman and their children, Kevin & Dusten of Sleepy Eye, MN; Billy (Shellie) Hoffman of Mitchell, SD, Randy Hoffman and his children, Jamie, Tyler, Mason & Cory of South Dakota and Christina (Norm) Weber of Craig, IA and her daughter, Bonnie Hoffman of Sioux City, IA and Bonnie’s son, Samuel Rosenkranz of Sioux Falls; aunt, Joan Vohs and son, D.J. of Lake View, IA. There are many cousins, aunts & uncles, other relatives and friends along with Johnathan’s grandparents who’s here in Spirit, Everett & Hazel Hedberg, Joe & Collette Hoffman and his uncle, Jack Hedberg.He will be missed dearly by everyone. To send flowers or a remembrance gift to the family of Johnathan Hoffman, please visit our Tribute Store. Or, if you would like to donate to the family, please visit Johnathan's Tribute Fund. Guaranteed delivery before Johnathan's visitation begins. Guaranteed delivery before Johnathan's memorial service begins. Help ease the financial burden placed on the Hoffman Family after the loss of a loved one by making a donation. "Email Address" would like to share the life celebration of Johnathan Hoffman. Click on the "link" to go to share a favorite memory or leave a condolence message for the family. Provide comfort by sending fresh flowers from our local florist or donating to Johnathan's Tribute Fund.